If there are any certain things in life, they're death, taxes and weeds (and perhaps that more of our favorite characters will be killed off in the next season of Game of Thrones — pretty sure we can count on that, too). Though spraying with Roundup might seem a simple solution, funding Monsanto and dumping poisons on my little patch of the Earth hasn't ever been how I want to approach the garden, not only for ideological reasons (of which there are many) but also because I enjoy the garden barefoot with my toddler and baby and love watching all of the visiting birds and pollinators, and I don't want to inadvertently harm any of us. If you are chemical-free in your garden as well, here are a few techniques you might not have heard of to gain an edge over the weeds. A flamin' good time. 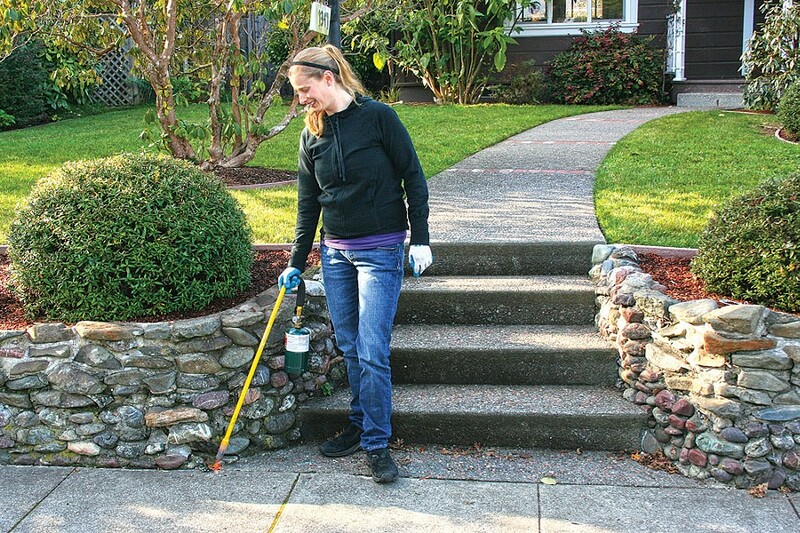 If you have both teenagers and weeds, a propane weed torch could be an ideal solution for you. What could teenagers like better than the feeling of power that comes with wielding a flaming torch around Mom's prized hellebores? Weeding torches work by burning off the waxy coating on the outside of each leaf which keeps moisture in, so the weed dehydrates and the foliage dies. However, like so many organic solutions, weed torches don't kill the roots, which means mature weeds may take a few treatments. They can also start a fire if used around landscaping plastic or fabric, pine needles or small woodchips, so they are best used in gravel pathways or the cracks of the sidewalk far from anything flammable. A souped-up spray. There are a number of organic weed controls on the market, and the most effective ones that I've found either have 20 percent acetic acid (such as pickling vinegar, not to be confused with regular vinegar which only has 3 to 5 percent acetic acid) or citric acid as the main ingredient. Just like a weed torch, these sprays work by "burning" (in this case a chemical burn) the waxy cuticle surrounding each leaf, but they don't kill the roots because, unlike Roundup, they aren't using a hormonal disruptor to achieve the results. That said, you can increase the effectiveness of any spray by adding a spreader sticker product to your sprayer, which helps the spray adhere to the leaf surfaces. Some people use dish detergent for this purpose, adding it to a homemade blend of vinegar and salt, but dish detergent and salt can cause lasting problems in the soil, so I wouldn't advise it. Lethal injection. Dandelions and other tap-rooted weeds in the lawn are a common sticking point for organic gardeners, because most organic sprays are nonselective, which means they'll kill your grass just as easily as the weeds. One solution is injecting the hollow taproot with pickling vinegar or another organic herbicide, rather than spraying, which can get all over. Until recently, I used a needleless syringe, like what you'd use to give your pet oral antibiotics, and squatted down to inject each dandelion at the base, trying to fill the root with vinegar to "pickle" it and keep it from resprouting. However, I just discovered a new tool called the Earth-Shot which cuts off the leaves at the base (making it impossible for the weed to photosynthesize) and injects a shot of the herbicide of your choice into the taproot. This has tripled the speed with which I can get through a lawn and the weeds rarely come back. Grampa's Weeder gets an upgrade. Another great way of dealing with tap-rooted weeds, either in the lawn or in garden beds, is to use a standing weeder. It's basically a pole with some spikes at the end that allow you to grasp the weed and remove it from the ground without bending over. While Grampa's Weeder is the most commonly known brand, it feels clunky and you have to kind of shake it over your bucket to get the weed off. My favorite two models allow you to shoot the weed a few feet away to wherever your bucket is, so you can cover a lot more ground with less effort. The Deluxe Stand-Up Weeder from Fiskars is one such model and has a sharp set of four claws to grip the weed as well as a comfortable plastic handle. The Weed Zinger is all metal and has a spring-loaded action which makes an addictive clicking sound as you gear up to shoot the weed into the compost bucket. Let it bee. While talking about how to remove dandelions from the garden, I'd be remiss not to mention that dandelion flowers are one of the first foods for early pollinators, so if you have a wilder or more natural area of the garden where you can allow them to flower in spring for honeybees and our native bees to enjoy, you'd be doing a wonderful service for the bees and would also have better pollination for plums and other early-flowering fruit trees. Just be mindful about it, and when you see the first spring flowerbuds emerging, don't mow until they're done blooming. Get geared up. Good old hoeing and hand weeding are still some of the most effective techniques out there, because there's no risk of herbicide drift and you can often get the roots on the first try. Hoeing is perfect for when you get a number of teeny tiny weeds coating the surface of your mulch, gravel, or soil, because you can actually uproot them with a hoe while they are still small. I like the DeWit hoe-rake, a Dutch innovation that allows you to hoe the weeds and rake them with one step. I'm also a devotee of the Pro Gardener's Digging Tool from Garrett Wade, a super rugged soil knife that has an offset blade which gives you extra leverage when digging out established weeds. Though it's not cheap, the construction is outstanding and I've never seen one break or bend in years of use by my crew. Prevention is the best cure. If you have garden beds with visible soil in between each plant, the best thing you can do to reduce how many weeds come up is to add 3 to 4 inches of wood chip or bark mulch to cover the ground. Wood chips make it tough for any seeds already in the soil to germinate, and leave an infertile layer on top so that if any weed seeds blow in from elsewhere, they find it tough to gain purchase in the soil. Similarly, planting large stands of perennials, woody groundcovers or anything else that will grow and cover the ground will allow your good plants to shade out and outcompete any weeds that might try to grow. Lastly, if a weed does pop up, don't let it go to seed, or you will have hundreds to pull where you once had one. Eat them. When we buy packets of lettuce seeds and painstakingly sprout them, we are very proud to eat the contents of our gardens, but when it's a weed, somehow there's a bit more hesitation. As long as you are gardening organically and are familiar enough with your plants to know what you're eating, there's no reason not to sample the goods. Young plantain leaves can be eaten raw or sautéed, and mallow or cheeseweed can be steamed or sautéed. Dandelion leaves make a delightful addition to a salad, and the flowers can be breaded and fried (or made into wine if you're a Bradbury fan). If you get really into the whole free eats thing, check out the book California Foraging: 120 Wild and Flavorful Edibles from Evergreen Huckleberries to Wild Ginger by Judith Larner Lowry, which will help you find all kinds of tasty snacks on your afternoon walks. Genevieve Schmidt owns a fine landscape maintenance company in Arcata. Visit her on the web at www.GenevieveSchmidtDesign.com.